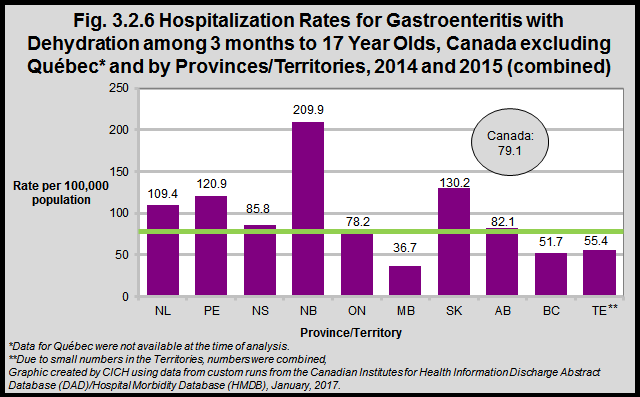 In 2014 and 2015, the rate of hospitalization for gastroenteritis with dehydration among children and youth in Canada, 3 months to 17 years of age was 79.1 per 100,000 population. The Maritime provinces all had higher rates than the national average with the highest rate in New Brunswick (209.9 per 100,000); Saskatchewan had the second highest rate overall (130.2 per 100,000). The lowest rate was in Manitoba (36.7 per 100,000). This indicator does not include children who have underlying gastrointestinal problems such as inflammatory bowel disease, that would predispose them to gastroenteritis.